UPDATE: The bad news is this deal is sold out. But the good news is you can clip the 5% coupon and use the promo code 9L5FERT8 at checkout on this nearly identical LED strip light and get it for just $13.76! EARLIER: Before you go and drop $90 on a Philips Hue LightStrip Plus and another $60 on a hub if you don’t already have one, there’s a sale happening right now on Amazon that you definitely need to check out. The Govee WiFi LED Strip Light is a multi-color light strip that’s just as long as the one from Philips Hue. It also can be controlled using an app or Alexa/Google Assistant, just like Philips Hue. So what’s the main difference between them? This one only costs $14.78 if you use the coupon code WEHZL3GH at checkout! WIFI WIRELESS CONTROLLER: Take complete control of your lighting with Govee Home APP; Create romance, relaxation, party ambiance with Music and Mic function; Remote control allows you turn on/off the led strip lights from anywhere; Timer function of the wifi controller make you wake up at your favorite color, keep you on Schedule. Note: Please kindly close to the control box as soon as possible when connecting wifi. 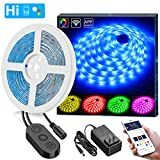 BRIGHT LAMP BEADS : Unique design RGB LED light strip, a variety of colors and brightness can be changed, Extend the beauty and elegance of colorful throughout your entire home.